What started as a simple “what if?” twist on the home-invasion thriller has grown into a giddy exercise in B-movie mayhem with increasingly blatant political commentary. 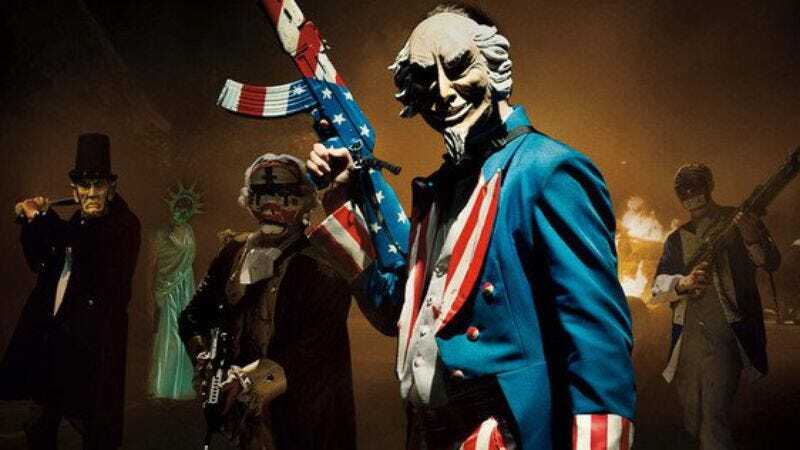 Fittingly, The Purge series goes for broke this summer with Election Year, in which a presidential candidate (Lost’s Elizabeth Mitchell) who opposes the outdated barbarism of the annual “purge” becomes the target of staunch traditionalists who would rather things stay as they are. Frank Grillo returns as the politician’s only line of defense in the streets against honestly sadistic Abe Lincolns and blood-lusting Lady Libertys. The Purge: Election Year opens in theaters everywhere on July 1, but The A.V. Club and Universal have an opportunity for you to see it for free on Tuesday, June 28. For your chance to win a pair of passes to the advance screening, simply enter your information here. Remember: Advance screenings are often intentionally overbooked, so be sure to arrive early if you want to guarantee yourself a seat. An official plot synopsis and trailer for the film can be found below.